A few days ago we focused on hitters that have been known to get off to a hot start, and today we will focus on pitchers that we have come to rely on in April, in each of the past three MLB seasons. Just like with the bats, there is an arm (or two) in this list that really doesn’t belong. Let’s start with Anibal Sanchez – prior to the start of the 2013 season, the Tigers handed him $80 mil. Looking at this list of pitchers, seems like that was a great signing. However, the first number of his ERA has increased in each of his three full seasons with Detroit, up to 4.99 last year. That being said, we are only worried about April here. In 2013 he won three of his five starts and finished with an ERA of 1.34, 1.04 WHIP and a 41:9 K:BB ratio across 33.2 iP. That accounted for 47% of his April points scored over the last three years. Only Madison Bumgarner (48% ’13) and Johnny Cueto (48% ’14) had one year (month) be such a factor in them making this list. The other pitcher that “doesn’t belong” on this list is Jeff Samardzija. Bias aside, he is a good example of why counting wins in fantasy baseball doesn’t really make sense. In April of 2014, Samardzija went 0-3 despite owning a 1.98 ERA across six starts (41 ip). Actually, he is just 2-9 in early baseball. 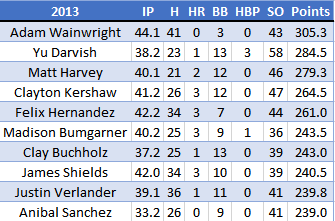 Sonny Gray, Justin Verlander, Hyun-Jin Ryu and Aaron Harang each have two, 200 point Aprils in the last three years, but each had one year that prevented them for eclipsing 500 points. Remember when Yu Darvish was around striking out 13.7 batters per nine innings in April of 2013? 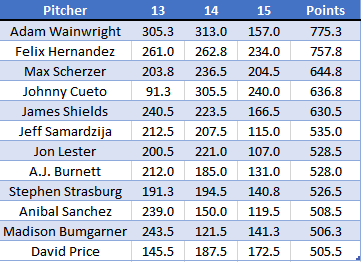 Hey look, Adam Wainwright was the best pitcher in April for back to back years! After just one pitcher reach 50 K in April of 2013, the MLB was falling in love with Jose Fernandez, before Tommy John took him away, and saw Max Scherzer and Johnny Cueto have career years. Stephen Strasburg also punched out 50 batters in April, but only lasted 34 innings – averaging less than six inning per start. How did Nathan Eovaldi sneak in there? The only other month he had an ERA below 4.00 was August, and still finished with an ERA over 5.00 after the All-Star Break. No pitchers struck out 50 batters last year in April, and only Clayton Kershaw and James Shields even struck out 40 batters – and neither made this list. Kershaw had an ERA nearing 4.00. Both pitchers only lasted 31 innings over five starts. 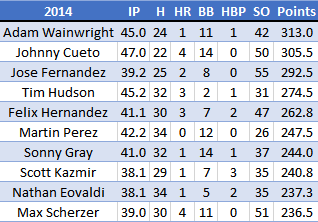 Remember that start to the season Aaron Harang had last year? He finished April with a WHIP under 1.00, and over 3.5 K/BB. 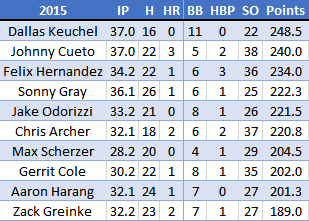 Dallas Keuchel, Sonny Gray, Chris Archer and Gerrit Cole all gave fantasy baseball a great year and are going to have live up to HIGH expectations in 2016.